IN MEMORIAM: We were sorry to hear about the recent passing of Donald Graves. He was an inspiration to writing teachers everywhere. He's pictured here with our colleagues Sara Beauchamp-Hicks and Paula Diedrich. Amy and I will fly to Orlando in November for the National Writing Project‘s Annual Convention. After receiving a grant from the Holocaust Educators Network, we were selected to present on how we brought a survivor to our rural school district. We will show a digital story in which we ask, “How do we get our students to care?” Having our work included as part of a national dialogue makes us feel validated as professionals; also, our ongoing social justice inquiry remains an aspect of our lives that we are committed to sharing in the classroom. Here’s the question: When Amy and I go to this conference, will our three days out of school have a positive or negative impact on our students? Teaching is complex. In addition to being masters in our content areas, teachers are asked daily to perform roles similar to that of counselor, nurse, and parent. One teacher cannot be expected to know everything. However, if there is one area in which teachers should be experts, it is learning. The best way to show students how to learn is to share our own passions and our own quests for knowledge. When we model our curiosities and the way we find answers, we show students how to love learning. So why are some administrators, parents and even teachers opposed to having part of our teaching duties include professional development? You wouldn’t tell other professionals to stop learning. Would you send your child to a doctor who hasn’t stayed current with best practices in medicine, new medical research, and new technologies in the field? Then why would you entrust your child’s education to a teacher who hasn’t been provided opportunities to learn about best practices in education, new research on how children learn, and new technologies for the classroom? Teachers constantly are asked to meet higher standards and to teach more rigorous curriculum, but how will these teachers get informed? Where is the support to make these changes? Amy and I are blessed to have found that support with the National Writing Project. The NWP is a network of educators from all content areas and grade levels working together to improve the teaching of writing. The NWP model is “teachers teaching teachers,” with sites around the country emphasizing common principles of high quality instruction and the professional development needed to support it. Teachers know that the best professional development is collaborative and ongoing. Our involvement with the Upper Peninsula Writing Project has provided us with opportunities to present at the local, state and national levels. It has funded our travels to professional development conferences around the country and paid for our substitute teachers while we were away. It also has funded many of our post-graduate credits, including the internships that led to our Masters degrees. Most importantly, this learning community has provided us with a network of teachers who are passionate about helping students become successful writers and learners. 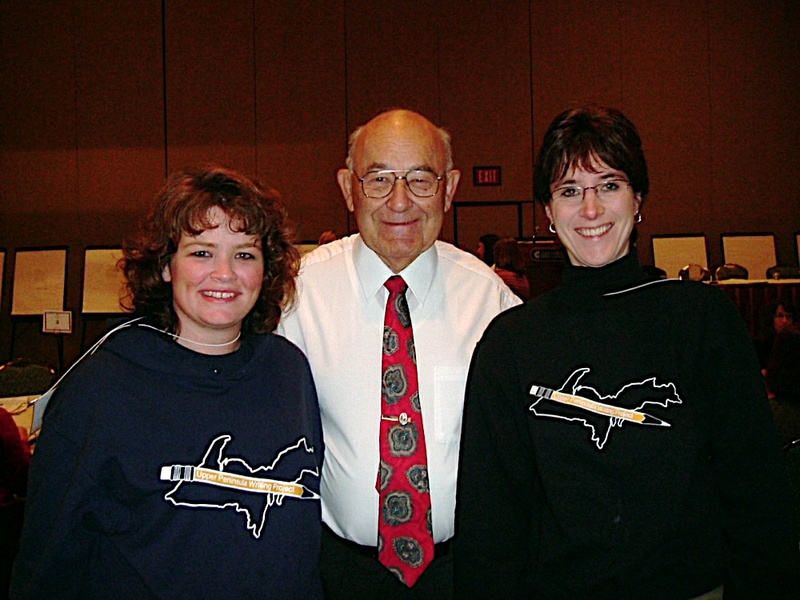 When Amy and I attend conferences, we are privileged to meet writers who influence the way we teach writing. I remember, for example, attending a luncheon in San Francisco where Adrienne Rich read her poem “The School Among the Ruins.” With a full house, Amy and I sat on the floor near the door. Even though we couldn’t see Adrienne Rich, the emotion in her voice was palpable, a thick electric current wrapping around our souls and jolting awake our senses to the complexities of the world. We wiped away tears as we listened, and we nodded to each other in silent understanding of how that experience would shape us. 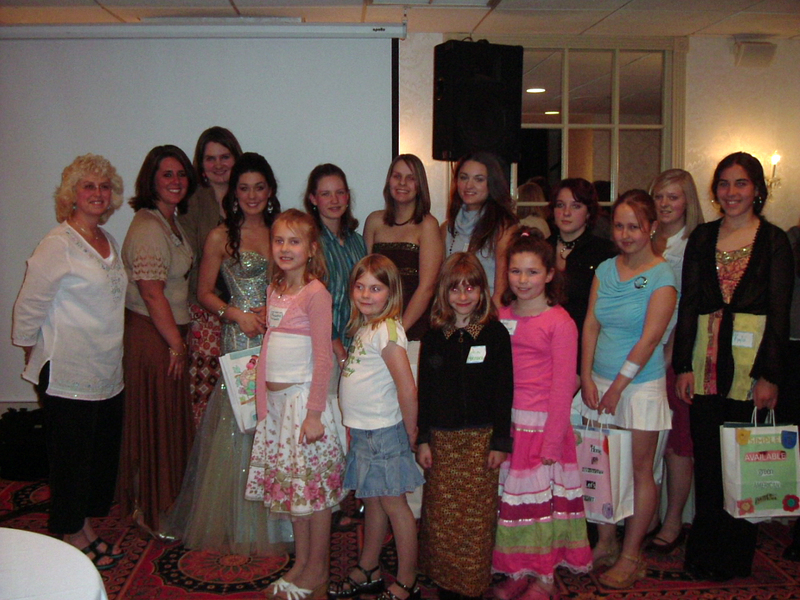 Students who participated in the Rural Poetry celebration. Jeni is in the formal dress. We returned to school the following Monday, eager to share Adrienne Rich’s poetry with our students and to try to articulate how poetry can seep into your marrow to become a living part of you. A couple of years later, we harnessed our energy and that deepening love of poetry to develop a rural poetry initiative in the Upper Peninsula. This led to one of our students going to Washington D.C. to read her own poem at the Library of Congress. Watching Jeni Schrandt stand up with confidence to share her poetry with teachers and other student poets from around the nation will remain a highlight of our careers. Amy meets poet Naomi Shihab Nye in Nashville. 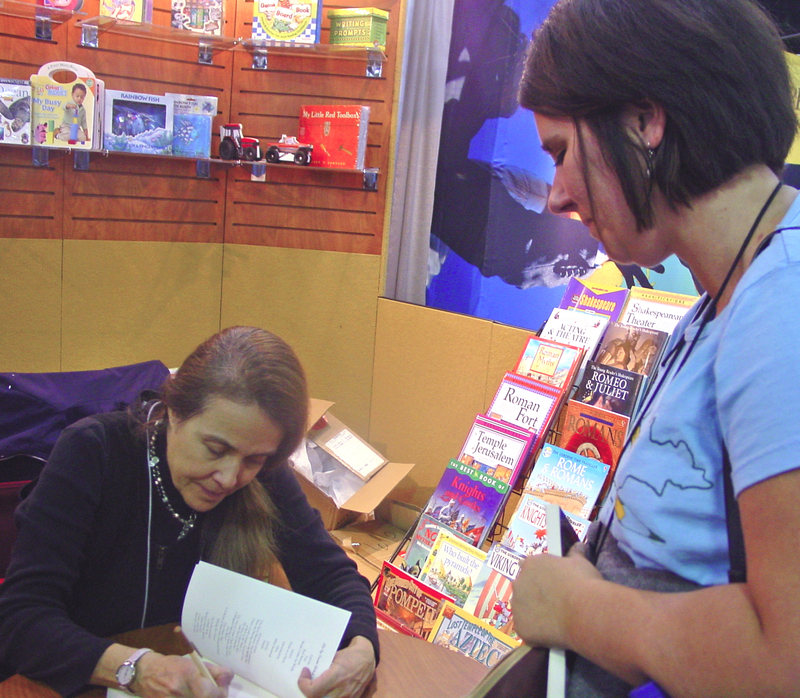 Another time, in Nashville, Amy and I met poet Naomi Shihab Nye. While Naomi signed our books, Amy made small talk about her husband Mike serving in Iraq. Naomi reached for Amy’s hand. She didn’t just shake Amy’s hand, or give it a light pat. No, with two gentle hands, Naomi Shihab Nye held and squeezed Amy’s hand, and didn’t let go for several moments. I learned something about compassion that day as I witnessed this exchange of love between two human beings who understand the hurt of war. Again, this was a teachable moment. I remember listening to author Frank McCourt speak to a group of teachers in Indianapolis. He read excerpts from Teacher Man about the struggles he went through in the classroom as a new teacher. We laughed and cried and related to those stories. I went back and told my A.P. English students — who were reading McCourt’s memoir Angela’s Ashes — about his wonderful sense of humor and his capacity for love despite the struggles he endured as a child. Our conversations about that book turned a new corner as I shared McCourt’s first-hand accounts. This is why teachers need to be encouraged to continue learning. It sustains us. It renews our energy to return to the classroom with the same kind of passion we felt when we began our teaching careers, youthful and idealistic. It’s what prevents us from burnout or from finding jobs in other fields when we get discouraged. Learning is our lives. It’s the essential part of our beings that led us to become teachers in the first place. We cannot nourish our students if we neglect to nourish ourselves. All teachers need opportunities for quality professional development. Some school administrators believe it is of singular importance for teachers to be in the classroom. They believe our sole job is to deliver content to be regurgitated on a standardized test. A handful of teachers might be permitted to go to conferences over the course of a school year and the rest are told no. This isn’t because of cost — often times all costs are covered and teachers are even provided with books, technology tools or money for classroom supplies — but because teacher are expected to stay in the classroom. This lack of support shows that teachers are not respected as professionals capable of determining what they need to best reach their students. Please don’t mistake me as a teacher who likes to be away from the classroom. Last year I took no sick days (thank goodness I didn’t get the flu during that H1N1 scare), and didn’t use all my personal days. I did take a couple of professional development days to attend a conference in Philadelphia. I went to learn about teaching writing; however, because of the location, I also learned about our country’s forefathers and saw places where our nation’s government bloomed –valuable background knowledge for any teacher. In addition to administrator support, teachers need community support in creating professional development opportunities. Some parents think their children shouldn’t have the day off for teachers to have a professional development day because it is difficult to arrange child care or transportation, or it otherwise interrupts schedules planned around the school day. Some community members say that teachers should have gotten the training they needed before becoming teachers. Others say that schools are supposed to educate the students, not the teachers. In order for these parents and community members to support us in getting professional development, they need to see how this time away will benefit the students. Some educators may not support professional development if their previous experiences have included sit-and-get lectures, wasted time away from students, or one-shot workshops. These are teachers who sit in the back of the room reading the newspaper on professional development days, expecting that nothing new will be presented or believing that their input won’t be valued. Why would they think differently, if that’s what they’ve experienced year after year? If teachers are pulled out of the classroom for training that is not relevant, then no wonder some teachers resent spending that time away from students. 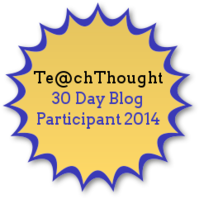 When professional development days are offered, teachers should be involved in the planning. This doesn’t mean asking them the week before what they want to do because nothing has been arranged yet, but means giving teachers adequate planning time and resources to develop sustainable training. Talents of individual teachers can be mined within their district if they are given the encouragement to share what they know. I open this dialogue to anyone who wants to participate in a conversation about professional development. Whether you agree with these viewpoints or offer alternative thoughts, it’s important to share our ideas so that we can move forward in doing what we do best, teaching. When we leave the classroom for that professional development conference, will our absence have a positive impact on our students? With every instinct I have as a teacher, I believe yes. What do you believe? This entry was posted in Holocaust Education, Reading, Teaching, Travel, Writing, Writing Project and tagged Adrienne Rich, Donald Graves, Education, Educators, Frank McCourt, Jeni Schrandt, Naomi Shihab Nye, National Writing Project, Professional development. Bookmark the permalink. What a beautifully written essay on the need for teachers to continue learning throughout their careers! And, what a great testimony to the power of “teachers teaching teachers,” one of the key principles of the National Writing Project. I so wish that our schools could be run by people who know about learning, both teacher and student learning. Having business leaders and politicians running our schools is slowly eroding the heart of our teachers, who are the heart of our schools. I hope many others will join you in this discussion and that teachers’ voices will become more involved in educational decisions. I first heard Donald Graves speak in the late ’80s. I read all his books and was using his ideas to augment so many of my own from the 70s. I felt that he and all the early leaders of the writing (and reading) workshop model were kindred souls. I truly loved him as a person and a professional. His wisdom informed and inspired. His work truly changed the face of education for thousands, if not millions of students. His legions of colleagues and followers were blessed to know and learn from him. I was impressed with the kindness of his humanity; his belief in the potential of all of us to be important and worth knowing. While I barely knew him, he was my teacher. I am saddened to think of all the teachers who never had the opportunity to hear him speak and I pray there are videos that can be sold. Even though he didn’t know my name, he recognized me when I would talk to him at conferences and for that I will always be grateful. Donald graves “got it” and what an example for us all.